I’m not the biggest fan of school holidays, they are too long, the kids get far too bored, the weather cannot or will not make up its mind, and I must be careful what I watch just in case my youngest comes wondering into the room. You spend the first week as a family, you do some nice days out but then the money runs short, so you watch films together and that’s nice but once you’ve watched what feels like every single superhero film ever made the kids again get bored. You ask them if they want to watch an adventure film but there is no agreement on which one; some love Indiana Jones, some don’t. Arguments happen, and everyone disappears back into their online lives and family time is disregarded. This year I didn’t ask about adventure films, I just chose a couple that were suitable for the entire age range of my children and pressed play, then watched as they all drifted into the room at various stages but ended up staying and enjoying what they saw. All hail Nicolas Cage for saving summer. Yes, the films I picked were the National Treasure movies, full of puzzles, conspiracy theories and wild adventures and treasure hunts. 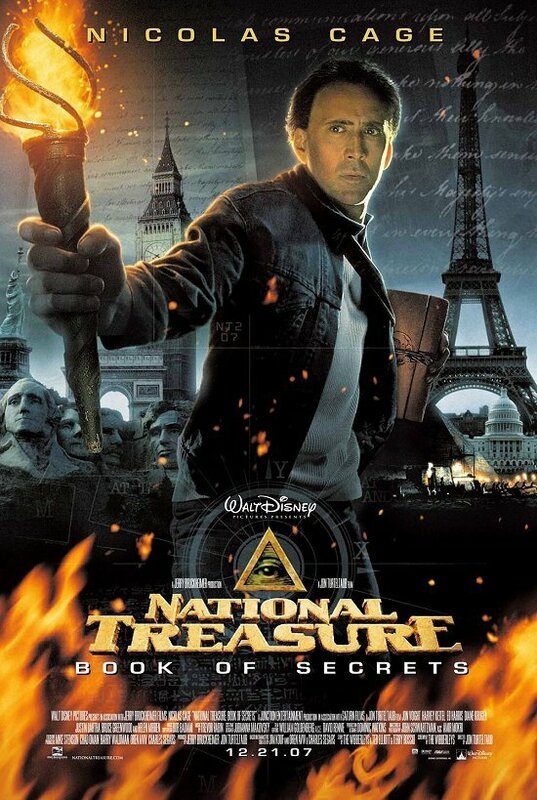 The first National Treasure in my opinion is probably the best film, although I prefer the political elements of Book of Secrets, but there are a couple of issues in that second film that, even for a Disney adventure film, push the boundaries of believability. Cage plays Benjamin Franklin Gates, a treasure hunter and historian whose family have a rich history in being involved in some of the most secret treasure hunts and political events. 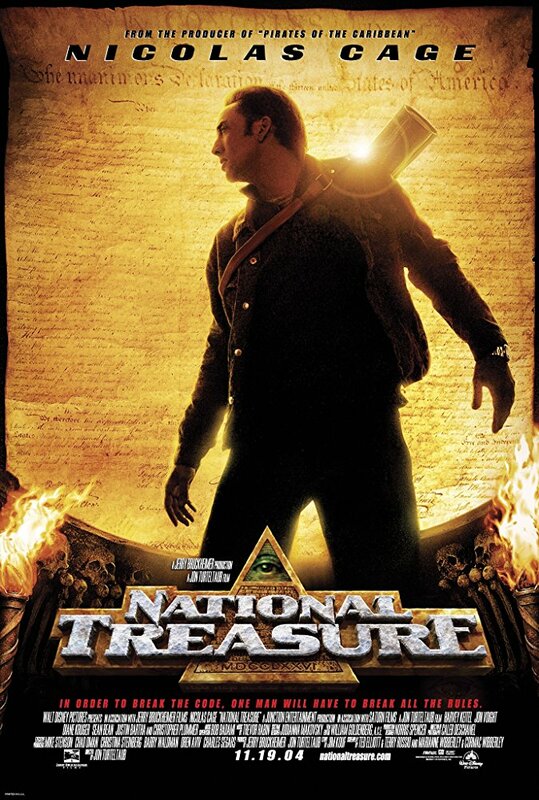 In the first film he is searching for the legendary treasure of the Knights Templar, alongside friend who turns foe Ian Howe (Sean Bean), his tech minded but frustrated assistant Riley Poole (Justin Bartha) and, due to having to steal the Declaration of Independence, the head of the archives Abigail Chase (Diane Kruger). A puzzle hunt and a chase takes Gates from the North Arctic, to Washington, to Philadelphia, to New York with F.B.I investigator Sadusky (Harvey Keitel) picking up the chase after the Declaration is taken. Along for the ride reluctantly comes Gates’ father Patrick (Jon Voight) and deep under Wall Street, despite all the odds and concerns for everyone’s safety, the treasure is found, charges are dropped, and financial reward is handed out. Skip forward a few years for the second film and we hear the story from Mitch Wilkinson (Ed Harris) that Gates’ relative Thomas is responsible for the assassination of Abraham Lincoln due to a, previously thought lost, page from the diary of John Wilkes Booth in Wilkinson’s possession. The hunt is again on as Gates seeks to prove his relative’s innocence. This time the hunt takes in Paris, Buckingham Palace, the Oval Office, and the kidnap of the sitting President (Bruce Greenwood). After the kidnap Gates finds the titular Book of Secrets, a book handed from President to President with vital information about everything you could possibly imagine and must involve his mother, a specialist in ancient languages Emily (Helen Mirren). Eventually, behind Mount Rushmore the clues lead to a hidden city of gold, Cibola. The films are nonsense of course, you could undo every conspiracy and every historical event or retelling of history with a quick Google search, but that’s not the point. The point of these films is to entertain an entire family and maybe teach everyone about certain historical elements, or spark debate about conspiracy theories, whilst entertaining in a way that Dan Brown doesn’t. Cage is perfect as Ben Gates, he plays the passion and disappointment so well and has, on occasion, reasons to burst briefly into Nic Cage type outbursts which please both adult and child, but probably for different reasons. Ed Harris is always a convincing bad guy, Sean Bean is always a convincing hammed up Brit, and the rest of the cast play off Cage like an ensemble who signed up to have fun and are adamant that fun is to be had. I was interested in the puzzles and hunt for the Templar Treasure in the first film, but my passion lies in American politics and conspiracies based on American politics, so the puzzles and hunts in Book of Secrets put me in my element and, if it hadn’t have been for the ease that Riley managed to get the Secret Service to choose a hotel of his choice for the President’s birthday, and the ease at which the President could disappear into a dark tunnel with Gates, I would probably hold up Book of Secrets as the perfect adventure film, but those two events whilst not the most ridiculous in either film, just took me out of the story briefly. Rated Parental Guidance here in the United Kingdom, the National Treasure films are a perfect way to fill an empty or rain filled family day during these never-ending holidays. You might turn your nose up at watching Nic Cage basically do a Nic Cage impression for four hours but, once you get past your own reluctance, you’ll find that Disney produced something magical and fun, something that either doesn’t take itself too seriously or takes itself far too seriously, but either way becomes a family fun filled day.